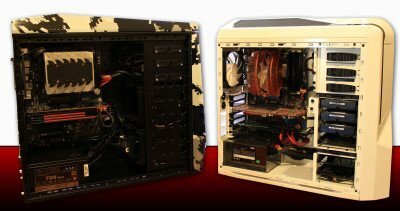 Mid towers are the most common PC form factor for PC enthusiasts, for many reasons. NZXT knows this and has quite the selection of cases for different styles and requirements. Today we cover the NZXT Phantom 410 in White, which is offered at an astonishingly low $99.99 MSRP. Compared to the full size chassis NZXT Tempest Evo, the Phantom 410 pushes the physical limits of what’s considered a mid-tower. Internally it’s a little smaller but externally it’s a bit closer. Gone is the old AC97 header for old motherboards. This isn’t a big deal at all, and most would prefer to have the HD audio plug as their only choice. It certainly looks nice to not have as many extra wires hanging around. There are 7 leads for 3pin fans, which connect to the 30W max fan controller mounted on top of the case,. Three of these are already used for the included 2 x 120mm fans, and 1 x 140mm top mounted fan. All fans are white, further matching the design. If you’re concerned with matching fans, you will need to buy the same NZXT fans because the front and top fans are visible. I had a hard time finding a matching 140mm, white blade, blue LED, NZXT fan online. This made finding a top matching fan more difficult. My solution? I moved the rear 120mm to the front so it would match (now there’s two in the front). The top 140mm fan would be moved to the left case cover. I would then be able to choose any two matching 140 mm fans for the top that I wanted. The top of the case also features 4 USB ports, two being 3.0. Internal wiring includes one USB 3.0 and one USB 2.0 header for motherboard installation. Next is the drive installation. The 5.25″ bays are tool-less which is extremely convenient. Using only the snap-in locks on the left side of the case will let your drives wobble around quite a bit. NZXT provides you with 2 thumb screws per bay. Using just one on each, the difference is night and day. Both do not require tools to install or remove, and the drives feel perfectly secure. The hard drive mounting method is also very easy to use and rather intuitive. They managed to not require any tools, handle up to 6 hard drives, and still mount the drive on 4 rather thin rubber grommets. This isolated mounting method greatly reduces drive vibration and noise. It wont be quieter than a silent case design like the Antec P182, but it’s certainly much better looking (preference of course). The quick video below shows the difference in mounting stability, along with how to install a hard drive in this case. The 4 drive HDD tray is removable, giving you insane amounts of space for any graphics card. You can literally fit 2 16″ long 3-slot graphics cards, which is 5″ longer than the Nvidia GTX690 and almost 5″ longer then the AMD 6970! Removing this tray will leave you with room for only 2 hard drives from there. For some who use an SSD for boot-up and 2 hard disk drives in RAID, this wouldn’t be an option. Luckily, leaving the removable tray in still fits most video cards on the market. 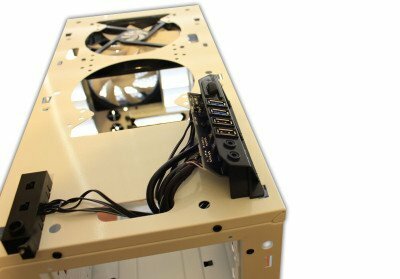 There’s also a mount for a 120 or 140mm fan inside the case which you can angle slightly towards RAM, CPU or your GPU (if it fits). 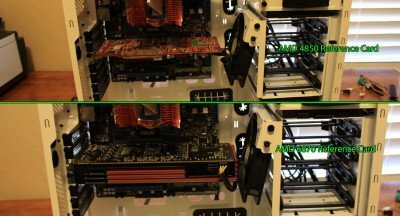 I installed a couple Radeon cards to give you an example. I didn’t run thermal tests on the efficiency of having a fan in there, but I wouldn’t completely discount it. The included fans on the low speed setting are nice and quite. Adding more fans will of course improve the cooling ability but the case already has great airflow. Airflow is extremely important when factoring in noise and fan costs because you can run fewer fans at lower speeds for adequate cooling. Increasing the speed and fan count will no doubt increase your heat dissipation for internal components such as CPU, RAM, and GPU. On the medium fan setting I was somewhat disappointed. There was a humming sound coming from the fan controller. It doesn’t do this on the low or high setting, but only the medium. Doing more research showed that some other users experienced the same problem. I usually leave my fans on low anyway, unless they go to high for more rigorous PC tasks. All in all I am extremely pleased with what NZXT has created. The machine looks great, has a lot of future proofing features, and comes in at a price far below what many would expect. Add in additional color choices and a strong customer reviews, it would seem that they have a winner on their hands. I liked it enough to use in my home theater build, which has already received some compliments from people I wouldn’t expect to notice.